The Lake Havasu Area Chamber Ambassadors held a ribbon cutting ceremony for Havasu Nursing Center celebrating its new remodel. 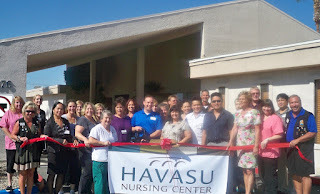 Havasu Nursing Center has been part of the Lake Havasu Community for more than 25 years and currently holds an excellent “A” rating with the Arizona Department of Health Services. They are a skilled nursing facility that offers 24 hour licensed nursing care as well as professional rehabilitation services including physical, occupational and speech therapy. For more information contact them at 928-453-1500.